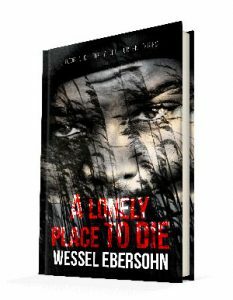 A Lonely Place To Die is a Yudel Gordon Novel. This is a rerelease of the original novel. It includes some updates and is now in eBook format. Muskiet Lesoro, terrified and schizophrenic, is accused of the murder of the local member of parliament’s son. Farmworkers and family all agree that he had enough motive to murder the violent and racist young man. Like the victim, Lesoro also had an undeniable tendency towards violence. Only one matter raises doubt in the mind of eccentric prison psychiatrist Yudel Gordon: this was a poisoning and, in his view, Lesoro was no poisoner. Someone else, someone with greater control and the ability to plan must be guilty of the crime. To discover the truth, Yudel travels to the country town where the crime was committed. He finds a society in which the truth is a carefully guarded secret and the townspeople, the people of the nearby black township, and the priests and brothers of a hillside monastery: all live in fear. Yudel finds his own life at risk as he asks the questions no one else has dared ask. A night time flight through as burning field of maize brings him face to face with the reality he has been seeking. The solution is not one he would have chosen, had there been a choice. Brilliantly evoking South African society. Mr Ebersohn’s prison psychologist hero is just the man to save an underdog from going under: a most original hero in a setting tylor-made for him. Of whom we must have more, much more. I came for the mystery and was rewarded with complex characters and a strong sense of place. The social and political climate of South Africa in the seventies is laid bare in the pages of this book. I like mystery writers with the chops to be able to weave the political climate into their books. This was an early book, late 70’s, so very different from the latest book. Very interesting race and power context.